It is something to consider when the focus off and on for some waivers between gift giving and receiving. The most memorable Christmas I can recall and one I’ll never forget, was one I had with my sister not that long ago. I know everywhere around the world, somewhere, there are people celebrating Christmas. What a joyous time of year it can be. With it having become so commercialized, we all struggle with having to remind ourselves of what it’s really about. It is a time to be reminded that over 2000 years ago we were given the best gift ever, the promise of a new King, our redeemer, Jesus Christ. It wasn’t a baby Jesus that would bring about our redemption, but the grown up Jesus fulfilling a promise to His Father that would change our lives. But lest we forget, it had to start somewhere. Though the exact date is unknown, his humble birth came around the time we now refer to as Christmas. He was our gift first with a promise. I’ve read many posts that remind us that it isn’t the gifts that make Christmas. Is that what we are teaching our children? How do they see Christmas? Is it a tree with lots of sparkly lights or the presents under it? I remember one year I took three gifts for each of my grand daughters to my daughters house for Christmas. It would be the one and only time we would celebrate with her in laws. As I came through the door, my grand daughters came running up to me and gave me an immense hug and said, “I love you grandma Jo!” We placed our gifts under the tree to open later, for when the other grandparents arrived. They were late and of course, the girls were getting antsy waiting for them to show. After some time, their father relented because well, it was Christmas morning!! They thanked us and gave us each a big, warm hug. Just about then, the other grandma shows up and the girls rush over and say, “What did you get us? !” Not hello, or Hi grandma, just “what did you get us?”. Grandma is followed in by Grandpa, who is loaded up with a boatload of gifts, making several trips and I’m not exagerating. The grandma says, “This is only part of them, the rest are at our house under the tree for when you come over later. The girls then proceed to tear into their gifts excited at first, but after the first two Barbies and/or outfits, package after package is ripped open and the item thrown to one side as they moved on to the next one, barely looking at any of them. My boys just stared in shocked amazement. Besides dresses and other girlie things, there was a total of 13 Barbies for each grand daughter. Yes, thirteen! They were barely six and three years old and as she said, that wasn’t all the gifts! I was nauseous. How would my grand daughters ever learn to appreciate anything much less the reason for the holiday? That was the last Christmas we attended with the other grandparents. We would from then on take turns for either Christmas day or Christmas eve. My boys are now grown and so are the grand daughters. My one son has a family now and last year we visited them in Texas. It was February and I noticed several Christmas gifts still wrapped on the window ledge. I looked at him quizzically. He said, “Mom, they got way too many gifts last year. I didn’t want them to do like the girls and not have a sense of gratitude. We let them open a few gifts at Christmas and save the rest for later. It is their reward for extra good behavior (he smiles), it’ll be awhile.” Smart man. Remember, this is February and there were still several unopened gifts, I can’t imagine how many they started out with. Thankfully, that Christmas many years ago had left it’s mark. Because it has become so popular and commercialized, there are people who don’t even believe in Christ that will celebrate Christmas or some semblance of Christmas. Does it matter? To some Christians, it probably does. For others, it only strengthens their resolve to stay focused on what it really means. My mother in law, for example, claims to be an atheist and celebrates with lights (no tree) the winter solstice. I know she’s not alone in this, I’ve heard others make the same claim. She is quick to remind me that for her, it is the winter solstice. I could make a big fuss and lose the relationship we have and never get a chance to “win her without a word” but I choose not to. For now, it is what it is. She’s a good person and a good mother in law and in time, who knows? I can only hope, by my example, that one day she will come to believe. One of the things I found interesting is that she and my sister who is a Christian, have a commonality when it comes to gift giving. They give from the heart. She packed up and quit her job, leaving sunny Florida for northern Alabama in what felt like one week! She took the day time shift and I would do nights. Hers was more difficult. The estate would pay her some, according to what the courts would allow. It wasn’t much but she was okay with that.After paying the bills she brought with her, there wasn’t much left over plus she had no time to spend it anyway. Needless to say, that Christmas, money was tight. I had bought her a scarf, a warm hat and gloves because Alabama can get cold. Even though it’s “south”, it isn’t Florida. I opened my gift in a decorated brown paper bag. In it was a couple of pencils, a handmade card and an orange. I cried. It was the best gift ever!!! It was so “Little House on the Prairie”ish (if you’ve read the books, you’d understand). My heart overflowed and she was delighted. So what is Christmas? I see it as a continued opportunity to share our love. It’s a reminder of the greatest gift of all. It is giving to others with the same unselfish love that was first shown us. The love God showed when he sent his son to us. The self sacrificing love Christ showed in giving up his life so that we might live. Christmas is about giving of self, giving when we think we have nothing to give. Teaching our children that the best gifts are those that come from the heart. Di’s coming to help saved my life. I had a mini stroke shortly after she arrived. It may have been a release from the stress I’d kept bottled up those three years trying to do it alone. Perhaps her being there allowed me to collapse, knowing she would take the reins until I was better. Together, we got through it and when one of us was down, the other would lift her up and so it went until both parents passed. There is no greater love than the love that causes someone to pitch in when they have little more to give. I’m in California and she is back in Florida now and it hasn’t been easy for her. At our age getting reestablished can be tough, but her kid’s and grand kid’s are there and that means the world to her. They shared her with me for awhile and even though I’d love to have her here, I know how much it means to have your kids close by. I miss my kids and grands and Christmases with them with all of us in four different states and none of us that close. At least she gets to see her kids regularly. What can I say? The love I have for my baby sister is abounding and I miss her. I love you sis and I thank God for giving you to me!!! That’s us in costume. Di may be shy but it was she that talked me into belly dancing after mom died. Oh what fun we had. We made and accessorized all our costumes with yard sale material and gems (of course). Later, I would follow and support her in her art. Art was an outlet that came out of her stress. She began using pen and crayon to entertain mother. Her first few were on scraps of paper, but I was so impressed with her work that I framed some and the next thing you know we’re doing art shows. We are a team. I am including two links that I’d love for you to visit. The above has her version of our story with mother. Keep in mind, our stories may vary slightly. She wrote hers closer to the actual event, whereas mine is by memory which is now six years past. 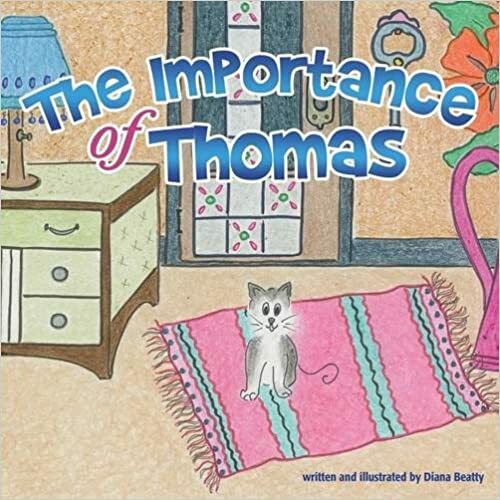 I highly recommend her book “The Importance of Thomas”. It is a heart warming story about a small kitten that came into our lives on Christmas Day and his role during an unusually hard time for us. Now available through Amazon. Thanks for following and a heartfelt and MERRY CHRISTMAS TO ALL! I think your mother-in-law and your sister have the right idea when it comes to giving. Gifts should come from the heart. As for the example of the other grandparents with all those Barbie dolls– well, that’s what Christmas shouldn’t be about. It almost sounds like they were trying to compete in their gift giving, which is a horrible thing to do and won’t teach children anything worth learning. That’s why I refused to do Christmas with them. I let my daughter know, I wasn’t going to compete plus it wasn’t healthy for a child to be overindulged. Judging by the character of the woman’s children… well, that’s another story. That marriage didn’t last, and since then the ex mother in law became less obtrusive in her gift giving. Go figure. My ex’s grandmother would buy birthday presents for all the kids no matter who’s it was. Nope. Don’t be doing that to MY kids. It’s B’s birthday. It’s HIS day. No one else gets birthday presents on B’s birthday. They didn’t like me for that but they weren’t going to ruin my kid’s birthdays. Christmas they’d go NUTS. No. Make the gift count or don’t bother. Wonderful and interesting stories. The in-laws with all the gifts were very strange. I would have been Yes, presents don’t make Christmas. What I remember most about Christmas was the board games we would play and the meal with us all around the table. I used to watch my grandmother get the turkey ready. How I loved her. I think of her every Christmas and I know I will see her in heaven. I love games! That is one thing my m-law loves them too! So much fun. Hmm, I touched something on the computer. I meant to say… I would have been upset too. I think it is wonderful that your sister came to help you and you let her come. We were just talking about that; because we had a big gap in our ages, it allowed us a chance to get to know each other better than as kids. Awesome experience. Love you and your sister. Hope you had a lovely Christmas! May you have a wonderful New Year celebration! And the best in 2017! A heartwarming post with a lot of thought. Precious that she was there for you. Take good care. This year has been shy of kids and that puts me in a frump. yeah, I get that. Xmas is for kids. Hi my friend, how are you ? I am good. We had family over for brunch. It was good. Thanks for good wishes and Happy new year to you as well! This was so special to read. Thank you for sharing such tender memories.